In September 2005, a female hot air balloon pilot, Pauline Baker, of Trim, Co. Meath, piloted herself into the record books. Following months of planning, Pauline flew a small, one-person balloon for over 90km and for 4hrs 2mins smashing both existing female World Records in that category of balloon that had been set some 30 years earlier. This momentous flight took place from Athenry, Co. Galway with a landing in Ballinacarrigy, near Mullingar, Co. Westmeath. This was the first time ever that an aviation World Record had been won by an Irish pilot for manned flying. Not content with the two World Records, the team decided that further records should be attempted. With this in mind, and following a huge amount of planning, the team headed out to the Italian and Swiss Alps in January 2007 to make attempts at records in the AX-1, AX-2, AX-3 and AX-4 categories. The team carried out testing in Italy in January 2006 to get an idea of the performance that could be expected and all were confident that some World Records could be broken by the intrepid aviator. 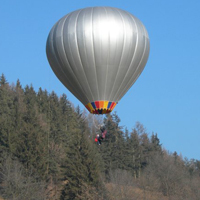 The classic picture that most people envisage is a balloon with wicker basket underneath with 3 or 4 people on board. 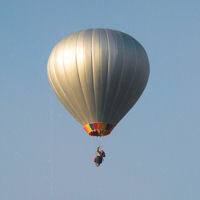 The AX-1 series balloon would be unable to lift a pilot in a wicker basket. For the record attempts in these miniscule balloons, every ounce is counted and Pauline will be suspended in a modified paragliding harness. The only 'basket' that will be used for the records in the slightly larger balloons will be custom basket built out of aluminium and fabric, weighing less than half of a similarly sized wicker basket. The balloons that will be used for the records have been specially built for the purpose of breaking records. They are made out of high-tech fabrics and would not have the same lifespan as a regular hot air balloon. The benefits are that they retain their heat much better and are significantly lighter than regular balloons made out of conventional coated ripstop nylon. As mentioned above, the AX-1 balloon is the one that is the most weight-sensitive. It is manufactured out of a very lightweight mylar fabric, with the whole envelope (canopy) weighing under 9kg. The fabric is a composite sandwich with two thin films of mylar bonded to a mesh inner layer. The burner is custom designed to be lightweight and two titanium fuel cylinders will be used. 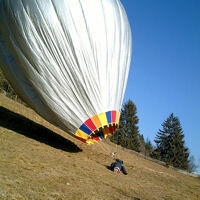 The dry weight of the complete balloon with pilot and fuel tanks will be under 85kg. Pauline wore a one-piece goose down suit and down boots. These provided the ultimate warmth whilst being incredibly light in weight. It was hoped that the ambient temperature for the flight would be -15 deg C or lower. On January 7th January 2007, Pauline Baker broke the female duration World Records in categories AX-2 and AX-3. The previous records for these categories of balloons (250 - 400 m3 capacity) was 2h 40min set in 1975. The flight was carried out in a Colt 14A balloon - G-BVKX. Pauline flew in the harness you see above with two 60 litre titanium fuel cylinders. 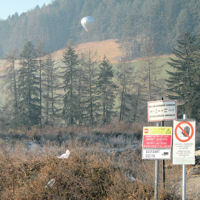 The flight took place in the Brunico valley where light winds were forecast. The surface temperature was -3 deg C and a strong temperature inversion (cold, dense air near the ground with warmer temperatures above) kept the conditions very stable. Within several minutes of launching, a fog bank crept into the area from a northern valley meaning that Pauline had limited visibility. The first fuel tank was dropped to the ground after 2 hours in the air from a height of about 3 feet. Pauline flew for 3h 36mins before landing in Fassine, Italy only a short distance from where the launch took place with less than 5% fuel remaining in the fuel tank. Unfortunately, weather conditions in the Alpine areas had been very mild for this time of year and this would have significantly reduced the duration that could have been expected. 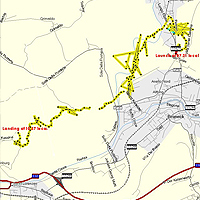 The flight track can be seen above. It is worth pointing out that the Dolomiti Balloon Festival was taking place 30km along the valley to the east where 25 knot westerly winds were being experienced!